Capital of the island of Eubœa in the Ægean sea; under Greek dominion since 1832. Benjamin of Tudela found 200 Jews on the island. There is also testimony to the early residence of Jews in Chalcis in a Hebrew inscription on a gravestone set in the city walls at the entrance-gate. This stone, dated 5086 (1326 C.E. ), shows that Jews came to Bœotia and Negropont before the expulsion from Spain, and therefore were not necessarily of Castilian origin. 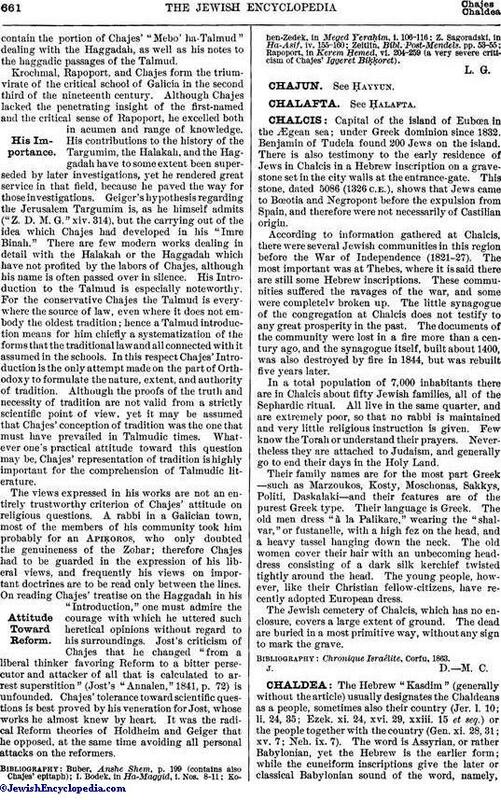 According to information gathered at Chalcis, there were several Jewish communities in this region before the War of Independence (1821-27). The most important was at Thebes, where it is said there are still some Hebrew inscriptions. These communities suffered the ravages of the war, and some were completely broken up. The little synagogue of the congregation at Chalcis does not testify to any great prosperity in the past. The documents of the community were lost in a fire more than a century ago, and the synagogue itself, built about 1400, was also destroyed by fire in 1844, but was rebuilt five years later. In a total population of 7,000 inhabitants there are in Chalcis about fifty Jewish families, all of the Sephardic ritual. All live in the same quarter, and are extremely poor, so that no rabbi is maintained and very little religious instruction is given. Few know the Torah or understand their prayers. Nevertheless they are attached to Judaism, and generally go to end their days in the Holy Land. Their family names are for the most part Greek—such as Marzoukos, Kosty, Moschonas, Sakkys, Politi, Daskalaki—and their features are of the purest Greek type. Their language is Greek. The old men dress "à la Palikare," wearing the "shalvar," or fustanelle, with a high fez on the head, and a heavy tassel hanging down the neck. The old women cover their hair with an unbecoming headdress consisting of a dark silk kerchief twisted tightly around the head. The young people, however, like their Christian fellow-citizens, have recently adopted European dress. The Jewish cemetery of Chalcis, which has no enclosure, covers a large extent of ground. The dead are buried in a most primitive way, without any sign to mark the grave.